There are firms and plenty of organizations whom would rather have their own “in-house” civil engineer working for them much like a printer would rather have his own “in-house” graphic designer. It’s easy to say that the job duties and responsibilities are the same regardless of the engineer’s work experience. Although, each engineer is different in their own right. All civil engineers should have one thing in common and that’s their education. Followed by a list of diplomas, certifications, degrees,…etc. Work experience which will depend on level of engineer (i.e. intern, fresher, mid-level, senior). Any relevant civil engineer affiliations, awards, or honors. 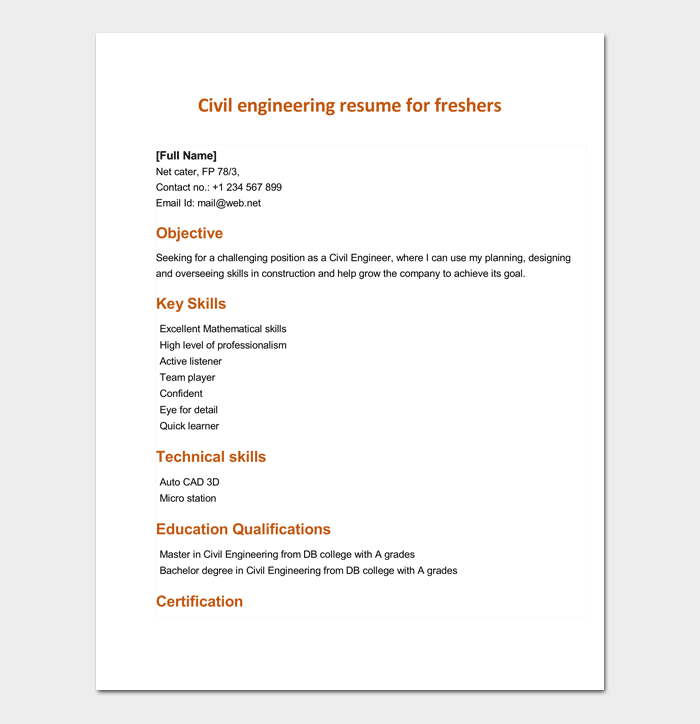 There are some elements that are found in a civil engineer’s resume which wouldn’t be found in any other resume. Following the Civil Engineer Resume guide, whether you are working for yourself or for someone else, can help you get your foot in the door to the right job you’ve been dreaming of since you got out of college. 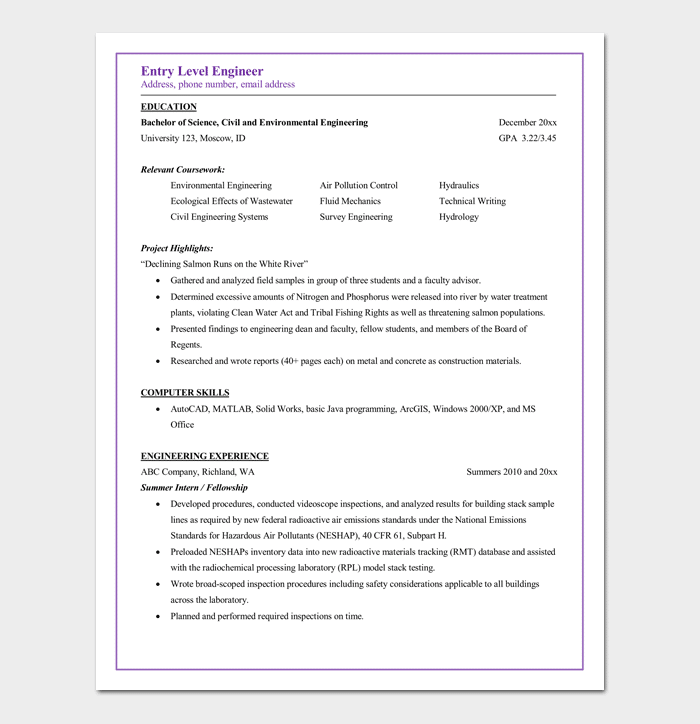 Conserving valuable time with a civil engineer template can help utilize time somewhere else, such as searching for that company or job you need. Here are a few examples that can help put it all together in a logical format and according to the need of the individual. A Licensed civil engineer with 4+ years’ experience and a registered member of both CIOB and ICE. Committed to providing high-quality services for each project and has a focus on health, environment, and safety. Able to work independently under minimal supervision, self-motivated, professional and offers consistent results even in challenging environments. Supervision 18 project employees who include internal contractors, in-house and subcontractors. Organizes and attends meetings with key stakeholders such as contractors, asset owners to discuss project details. Organized training for 3 new staff in a supervisory capacity to aid in the company expansion program. Conducts drafting as specified ensuring we follow all QA procedures. Prepares orders and inspects inventory for civil projects and refractory materials per the budget averaging $2,000,000 besides coordinating and consisting trial sections for the projects. Works in coordination with process engineers for evaluation and follow up and presents reports on trial materials according to laid-down procedures. Did shimming and column plumbing on steel elevations and dig permits. Conducted job hazard assessments to find out hazards linked to jobs task and implemented relevant solutions to minimize the risks. I was awarded several safety awards for adhering to laid-down safety procedures and recording zero OSHA recordable accidents. Invoiced clients and tracked soil progress through weekly quantity reports. Monitored project costs and progress besides coordinating the projects by establishing working relationships with sub-contractors and clients to establish their output needs. Software experience: EPANET, StormCAD, S-Frame, FlowMaster, SewerCAD and Culvert Master. Entry level Civil Engineer resumes for freshers should begin with the contact information and then the career objective. Next, the “fresher” should concentrate on his/her education and credentials, then professional work experience below it. This should be structured according to his/her education and capabilities of the profession. Basically, you are writing what you know from graduate school and that one-year professional experience, but highlighting educational details more importantly. With a Senior Civil Engineer resume, the format begins with the contact information and specialties. Naturally it’s going to be filled with the work experience, successful projects along with the firms or companies he/she worked for. References, education and the credentials follow those elements. Contact information and a basic header which states “civil engineer” and a summary of demonstration and knowledge of specific areas of civil engineering specialties. Education and credentials such as the school and honor courses, if any, or student’s activities list. This is followed by course highlights and any special projects then any internships or work experience. 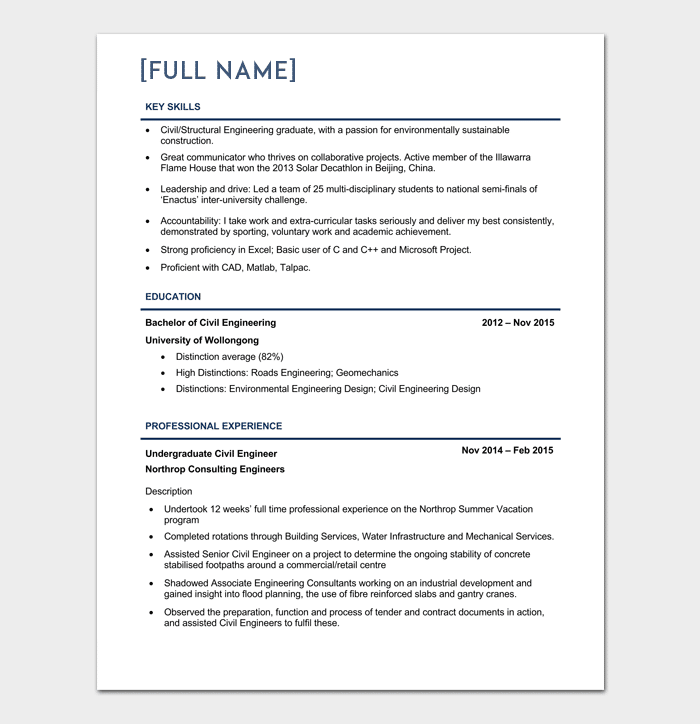 The sample resume for a Civil Engineer fresh graduate begins with the contact info, the career objective, and a list of skills summarized in a bullet list, preferably. Next, it will be the work experience, if any, then education and references. Materials science and engineering. This branch of engineering involves the study of the materials used to make structures, engineering devices or any other products used in civil engineering. The field of study involves understanding how to use various materials, creating new materials and making improvements to existing ones. Coastal engineering. Coastal engineering involves the designing, building, and maintenance of coastal structures. A coastal engineer must consider the hydrodynamic effect of sea tides, waves, tsunamis, storms, and the harsh salty environment as they develop structures in the coastal regions. Construction engineering. It’s a discipline that involves planning, designing, construction and management of infrastructure like airports, tunnels, roads, bridges, dams, and railroads among other projects. Earthquake engineering. Earthquake engineering is a discipline that considers the design and construction of structures concerning their response to seismic loading. It ensures that structures are designed and built to reduce damage to the structures in case of earthquakes. Environmental engineering. It’s a sub-branch of engineering concerned with improving and protecting the environment. The main fields in environmental engineering include; hazardous waste management, water pollution control, wastewater treatment, solid waste management, and air pollution control. Geotechnical engineering. Geotechnical engineering is a field of engineering that studies how soils behave under the effect of forces and the interaction of water and soil. It’s an essential field in the design of foundations, earth dams, clay liners and retaining walls. Water resources engineering. It’s an engineering discipline that incorporates other fields of engineering such as environmental engineering, civil engineering, planning, agriculture and geography to address water concerns in the society.Its main aim is to develop and design water solutions that aim to protect wetlands, groundwater, soil, rivers, lakes, and streams to make sure new water systems do not disrupt natural water processes. Structural engineering. This is a branch of civil engineering that is concerned with the design, planning, and development of economic and safe structures. It ensures that the tools and materials used will result in sturdy structures able to bear the intended load. Surveying. It’s a field of study involved in determining the position of natural and man-made structures on the surface of the earth. It’s used in determining boundaries and the location of structures on land such as bridges, roads, buildings, etc. Transportation engineering. It’s a field of study involved in the design, planning, analysis and operation of all forms of transportation such as road, rail, air and water transport. It ensures that people are provided with the right transportation structures that are safe and efficient. Municipal or urban engineering. It’s a branch of civil engineering involved in the design of municipal/urban structures such as parking lots, streets, sidewalks, sewer systems, street lighting, water supplies, etc. Forensic engineering. It’s the application of engineering knowledge and principles to determine the cause of failure or damage of structures and machines. The findings are used as evidence in a court, especially where human life was lost. Control engineering. It’s a field of engineering that combines mathematics and engineering to develop and improve machines, processes, and systems and make them more efficient. For example, a control engineer can make improvements on an ATM to reduce the time people use to make withdraws. 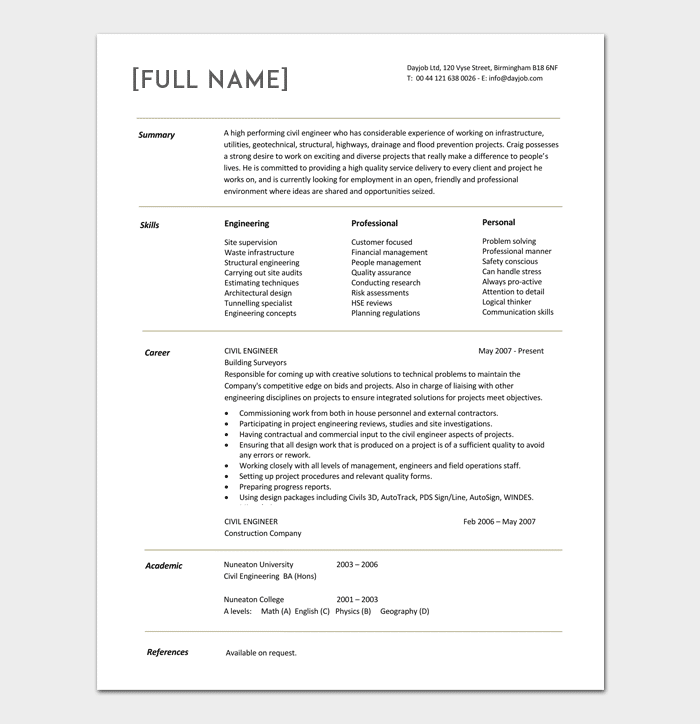 You can make improvements to your resume by quantifying your achievements and responsibilities; for example, you can use bullet points to show elaborate your achievements. “I managed to train 15 new civil engineers in my supervisory capacity”. Engineers earn decent pay. 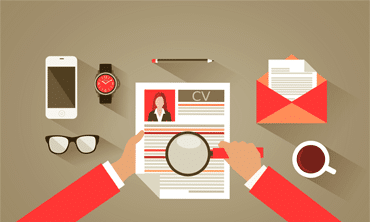 If you want to get a high-paying job as an engineer, you must make efforts to draft an effective resume. The salary will mostly depend on the geographical location, experience, and skills that the candidate has. Instead of majoring on the common skills such as entrepreneurial and communication skills, consider including skills you consider relevant to your profession. Knowledge of software’s used by civil engineers can be useful skills to include in this section. You can make your resume better by using specific verbs related to your engineering career. At the start of your professional experience section use these verbs to make your resume more powerful. Successful Candidates – Candidates who want to break into the professional civil engineer world should have a descriptive resume especially when it comes to skills, specialties, and knowledge on various civil engineer topics. Identify with a project list – Your engineering skills are what your years of experience in school or out of school account for. There were naturally “projects” you tackled in school, so list them. Similarly, you can list the special projects you feel were successful while professionally working with a company or as an independent contractor, so list them. 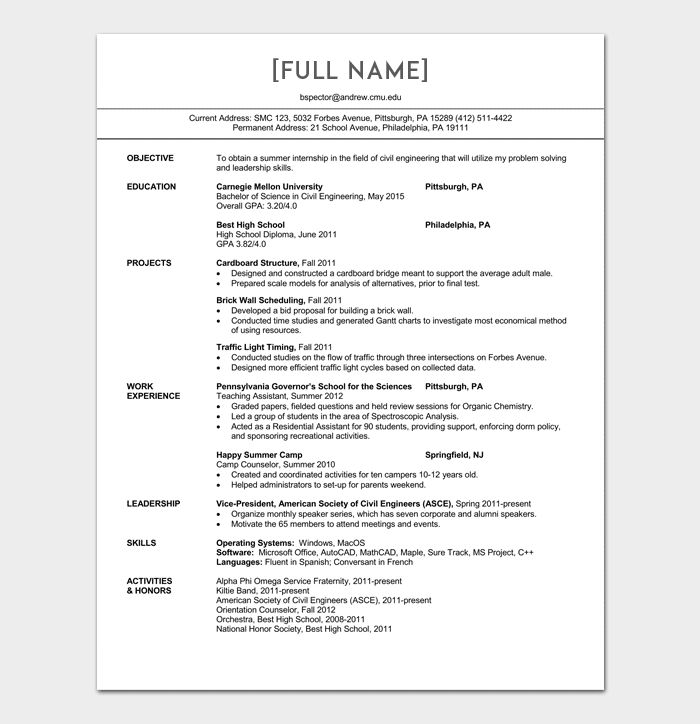 Format around the job position – Add those personal insights when tailoring your resume around a position you are seeking at a certain company. Customize it towards that specific target job opportunity to narrow down the search and keep it from looking so generalized. Identify Key Accomplishments – Utilizing a bullet list, write accomplishments and achievements in a few main words where the significance of the work is duly noted. If you have no work experience, this strategy is great for entry-level, freshers, and recent graduates.